After the terrible earthquake that occurred in Ecuador, habitants try to move forward, they try to help each other with the little they have. Thousands of schools and health facilities had to be rebuilt. Whenever a disasterstrikes children are the most vulnerable, children were left scared and without the proper health care and resources to help them, families still remain without a proper home, many orphaned children’s still haven’t proper health care and home. 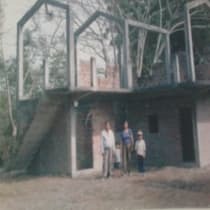 In Los Bajos del Pechiche near Montecristi (the city of Hat) and near Manta I decided to build a place for orphaned children who lost their families; so far I have spent my savings, due to the earthquake there are new measures of constructions, so construction materials prices have gone up :( . Thank you so much Godbless you every day forever.